String of lights in my room. This photograph showcases the concepts of both point and line. The fairy lights themselves, tiny glowing orbs, represent point because they are a single, finite object in space. 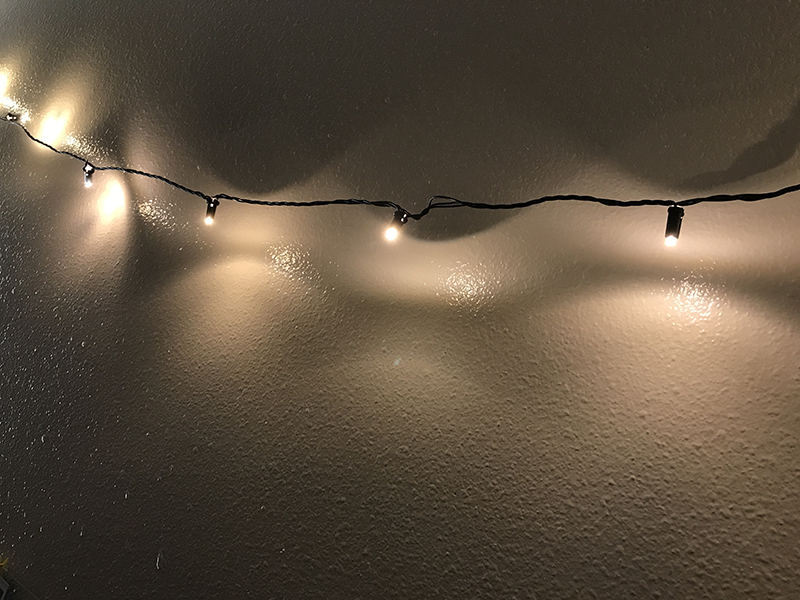 The string that holds the lights represents a line because it is a drawn out series of points, extending either from one point to another, such as in this case, or infinitely. The string demonstrates line in a curved format as well, as the flow is not strictly following a linear progression, but rather a slight parabolic one. 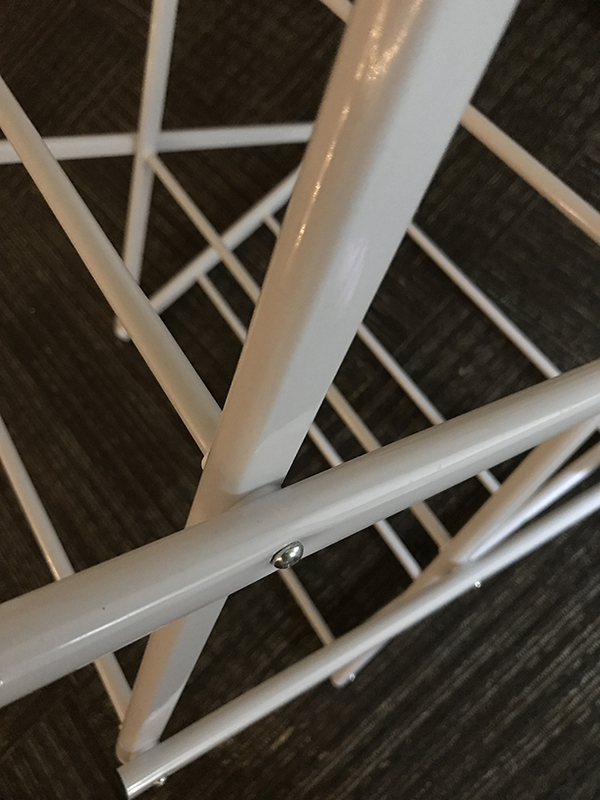 Close up of the lines of my laundry rack. This next photograph represents line as well, but in a more linear, overlapping fashion than the lights. The hard, thick lines of my laundry rack form more solid, weighty lines than the dainty fairy lights and give off an industrial feeling. They also form geometric shapes in the negative shape where you can see my carpet. This is a byproduct of the overlapping of the elements and the specific angle in which I took the photo. String of polaroids on my wall. This final image represents both line and plane. 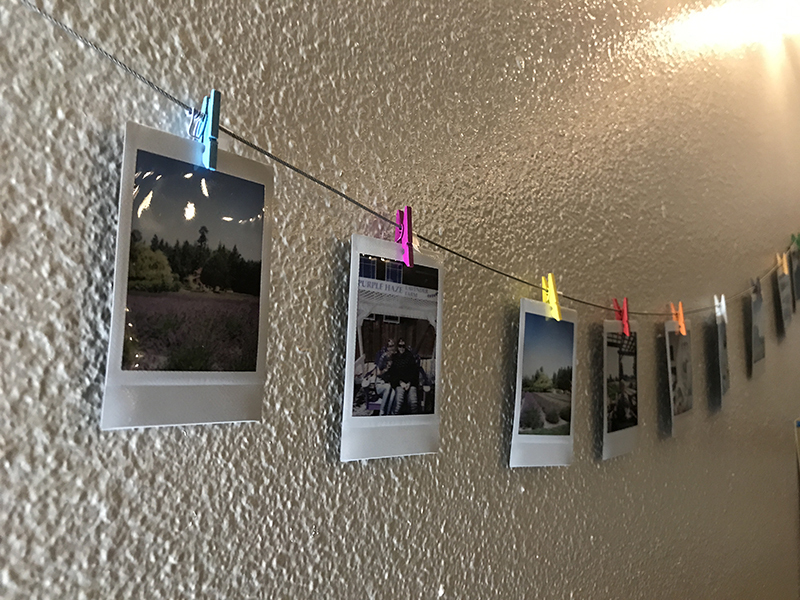 The line of the string holding the polaroids is a parabola, a finite connection between two points (the ends of the string, which are not visible in the image.) The polaroids, however, demonstrate plane, as they have breadth and take the form of rectangles, shapes that have width and height. The polaroids give the impression of depth and distance because I took the photo at an angle, thus altering the perceived width and height of the polaroids as they move farther into the background. The skewing of the polaroids showcases the nature of planes when operating in space.